Occupational therapy is a significant part of healing in the treatment of a diverse range of conditions including physical problems, mental health issues, and developmental disabilities. The Bureau of Labor Statistics describes the work that occupational therapists do as treating “patients with injuries, illnesses, or disabilities through the therapeutic use of everyday activities. 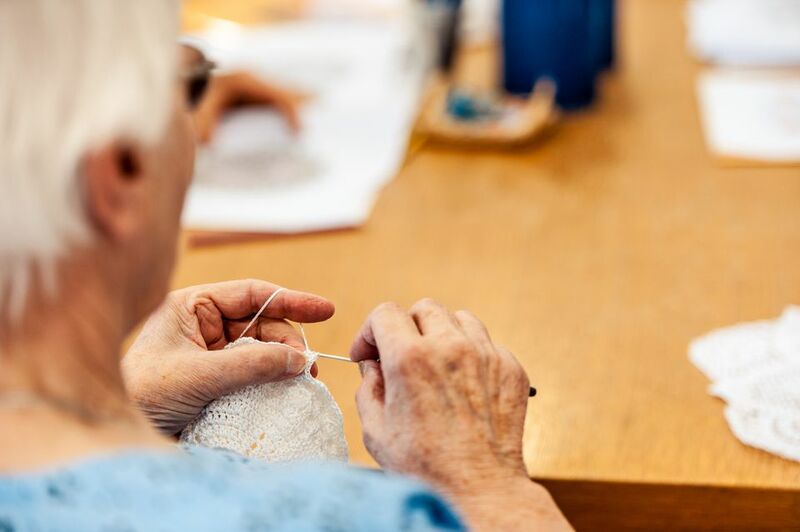 They help these patients develop, recover, and improve the skills needed for daily living and working.” The “everyday tasks” that are used as tools by occupational therapists are as diverse as the conditions for which the treatment is used and yes, one of the tasks in some settings can be crochet. Crochet can be used to help develop neuromuscular skills, fine motor skills, and cognitive skills and it is something that can be done by people of almost any age including many people who are differently abled. This, along with its affordability, makes it a great option for occupational therapists to consider. In fact, in the 1970s when alternative therapies were commonly explored and crafting was popular, some instructors at Occupational Therapy schools required their students to create files of instructions for crafts including crochet and macramé to use as a resource for their future patients. Art therapy is useful as a therapeutic tool for many reasons. One of the major reasons is that with art there is no “right” and “wrong”. This is true with crochet, as well, of course. Sure, there may be patterns you can follow and basic rules that make crafting easier, but in the end, crochet is a craft of self-expression and you can do with it what you please. This can be a relief for many people who are having trouble doing regular everyday things, like eating or walking, in the “right” way. Crafting relieves the pressure of doing something “right” and lets you just do something beautiful in whatever way you can. Additionally, it helps a lot that crochet is such a stress-relieving activity for most people. Trying to learn new skills or re-learn skills that you’ve lost to injury is stressful and frustrating. And of course, the more frustrated that you get, the harder it is to relax and learn those skills. So it is terrific if you can find a way to just relax and feel less stress. With more relaxation, the patient is going to feel more comfortable continuing therapy. And in an article by Bissell and Mailloux that reviews the history of crafts in occupational therapy settings for the physically disabled, it was found that “the use of crafts has been a central concept in occupational therapy since the founding of the profession”. The study done by Bissell and Mailloux is actually a really fascinating one because it shows the ups and downs of how crafting was used over time in therapeutic settings and how the waxing and waning of its use tends to have a lot to do with the politics of occupational therapy as an industry rather than the way patients may perceive its benefits. The authors share that the very first professional journal of occupational therapy included an article recommending crafting in OT settings and go on to talk about how crafting was first used as a treatment for the mentally ill and then, after World War I, it was extended to use in physical therapy settings for war-injured veterans. “occupational therapy during the early twentieth century grew from a philosophy known as moral treatment. The basis of moral treatment was “respect for human individuality and a fundamental perception of the individual’s need to engage in creative activity in relation of his fellow man”. So from 1900 to 1930 or thereabouts occupational therapy included an emphasis on crafting to encourage individual self-expression as part of the treatment process. In fact, from 1920 to 1930 there was a lot of momentum in spreading the word about the benefits of occupational therapy including crafting. The authors say that “the use of crafts was discussed in terms of physical factors such as strength, coordination, and endurance, as well as psychological and social aspects such as problem-solving, decisions making, self-esteem development and group socialization”. This was, in many ways, the heyday of crafting as a form of occupational therapy with many strides being made in celebrating how crafts can heal in both physical ways and psycho-social ones. Things were to change quickly, though, as a result of The Depression. When money goes away, social programs often change their emphasis and focus. Although crafts were still used in occupational therapy settings, there was a definite transition towards focusing only on crafts that could improve physical skills for the disabled, such as developing more strength, and much less emphasis (where there was any) on the emotional and social benefits of crafting. At this time, the occupational therapy community was really aligning more with the medical community, primarily for financial reasons, so the emphasis had to be on medical benefits of all aspects of OT. After the Depression ended, there was more emphasis on occupational therapy services again, but the change had been made and the community continued to focus primarily on using crafting for physical therapy and not psychological therapy. There was yet another shift in the occupational therapy community around the 1960s (a ripple effect from all of the changes happening in the culture at the time, surely). In places that treated individuals with disabilities, there was an increasing focus on not only improving their physical wellbeing but taking a holistic approach to healing their minds and improving their social options as well. There still wasn’t much written about crafting during this time in the OT community and it seems that there continued to be more emphasis on physical treatments, like exercise, rather than crafting as an option. This had begun to shift a little bit by the time that Bissell and Mailloux completed their own study in the early 1980s. Bissell and Mailloux found that out of all of the therapists that they surveyed, nearly three out of four “stated that they used crafts as part of their treatment plan to achieve therapeutic goals”. However, more than half of the therapists that were using crafting were doing so only about twenty percent of the time. The number one reason that they gave for not doing more with crafting was that it wasn’t something that was measurable and therefore couldn’t be documented and reported on. Although Bissell and Mailloux don’t say it, this likely has a lot to do with funding. Those who have worked in various non-profit and government agencies know that it is often tough to balance what is best for a patient or client with explaining why it is best to the people who are funding the organization that is offering the services. Occupational therapists might see huge benefits to crafting but if they can’t offer measurable proof that their methods are working than they may not be able to get the money they need to keep their methods going. Interestingly, Bissell and Mailloux found that there was a significant increase in the use of crafting in physical therapy settings that employed people who were specifically trained as Certified Occupational Therapy Assistants. Although most therapists were reporting that they used crafts in therapy less than twenty percent of the time, those places that did have certified OT assistants working with them were using crafts as therapy more than eighty percent of the time. This suggests that there was clear acceptance of the value of crafting within the specific niche of occupational therapy even if it wasn’t so widely accepted in the larger physical therapy community. Bissell and Mailloux published their findings in 1981. It seems that since that time there has been a revival in the celebration of crafting as a therapeutic technique. There has certainly been a revival of the handmade/DIY movement in general and there is a wide celebration of crafting in many other settings so it seems like there would be a cultural shift towards more of that in OT settings as well. To date, there don't seem to be any specific recent studies updating the work that Bissell and Mailloux did, though, so it is purely anecdotal to think that crafting is in a time of revival in therapeutic settings. That said, there are at least some occupational therapeutic settings (including both mainstream settings and alternative/holistic settings) that utilize crafting for physical and mental skill development. Note: This is an excerpt from the book Crochet Saved My Life, which is about the physical and mental health benefits of crochet and crafting.